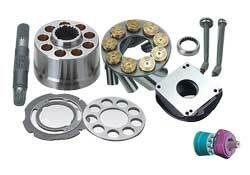 We are the leading supplier of Hydraulic Piston Pump Parts in India. Our hydraulic piston pumps spares are made using prime quality material and thus have high durability. There are Rexroth, Kawasaki and other major world brands manufacturing hydraulic piston pump parts but we ensure our clients with best quality hydraulic piston pump parts at reasonable prices. Our hydraulic piston parts include cylinder block, valve plate, drive shaft, piston shoe & other.